What’s your role in the Northwest Arkansas startup ecosystem? I’m a “Startup Junkie.” I spend my days planning and running different events and programs, or working one-on-one with entrepreneurs to solve problems and assess new opportunities. One of my favorite events that I’ve had a role in putting on is the Northwest Arkansas Venture MashUp – this is a bi-monthly event with two key goals: 1) Get people to meet the people they didn’t know they needed to know, and 2) highlight a local success story. We always have a local entrepreneur share their story, and there is locally-sourced beer, food, and networking built in before and after the talk. Personally, I got started with this work as in 2013 when I was a junior at the University of Arkansas and interning for the state’s first accelerator program – The Ark Challenge. While I was there, I caught the startup bug and became ever-more interested in the growing startup ecosystem in Northwest Arkansas. I came on full-time with Startup Junkie in 2015, and haven’t looked back! Can you tell us more about what your organization does? Startup Junkie, the consulting firm where I am the Entrepreneur-in-Residence, is a team of Swiss Army Knives. By that, I mean that we’re entrepreneurs, engineers, scientists, investors, and business minds on a mission to inspire, educate, and support entrepreneurs and innovators through no-cost consulting, programs, events, and access to capital and talent. We’re based in Northwest Arkansas, but we also have a team in Conway, Arkansas called the Conductor. “How can we make our services free to the entrepreneurs, and better than if they would have to pay for them?” is question at the front of mind when building our programming. It may sound counterintuitive, but startups are often tight on cash, which doesn’t make them great customers. Instead of charging the entrepreneurs, we work with enlightened public and private funding partners who understand that a thriving entrepreneurial ecosystem is the best long-term play for a region. It’s the Moneyball approach to economic development, and it’s effective. Rather than spending our time attracting Amazon’s HQ2, we focus our efforts and resources on growing one hundred different $100 million-companies to have a healthy, diversified, thriving ecosystem. What’s the most exciting thing that has happened for northwest Arkansas in the past year? The most exciting thing that has happened for our ecosystem has been the Startup Crawl, hands down. This was the largest event in history for our entrepreneurial ecosystem, and it blew our expectations out of the water. With a host of community partners, the event celebrated the local startup, technology, and craft beverage scene throughout Arkansas. 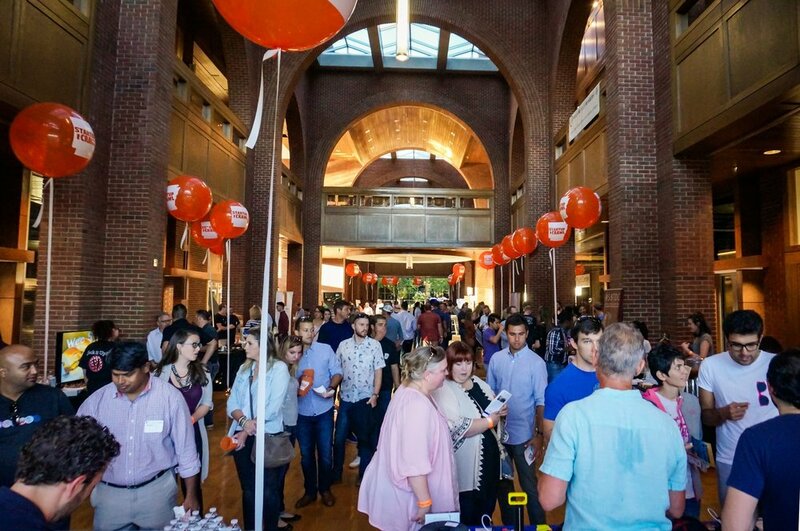 We wound up hosting over 1,200 people, and highlighted 50 companies at 12 different stops. We had four stages with live music from local bands, and most importantly had all 12 craft breweries and cideries in Northwest Arkansas paired with each stop on the crawl. We’re also excited that the third season of HBO’s True Detective will be shot here! I am proud of our city for pulling that deal together, and I hope they are able to fully capture the beauty of the Ozarks and the contagious energy of this region in the upcoming season. What makes Northwest Arkansas an ideal place to start a company? The city of Fayetteville is the startup city of the South! There’s some magic here that is much easier for me to feel than to articulate. This is a community that always roots for the home team-and wants to see our startups succeed. and a reasonable cost of real-estate. For context, you can rent centrally located office space overlooking the city for $30/square foot, and for less than half that, you can still find nearby space that meets all the basic needs of a startup. What industries have historically thrived in Northwest Arkansas? How has this shaped the startup ecosystem there? Walmart, Tyson Foods, and J.B. Hunt Transport are all headquartered here. Three Fortune 500 companies, including a Fortune 1 company, in a region with only 500,000 people is very unusual. We have more white-collar jobs per capita than just about anywhere in the country. That leads to a mentor network packed with subject matter experts in retail, food innovation, and supply chain. In addition, the entrepreneurial spirit runs deep here. The region was built by three forward thinking entrepreneurs – Sam Walton, John Tyson, and J.B. Hunt – who at the time, had no real regional competitive advantage. What is the biggest challenge you face in the Fayetteville? I hate to say this, but I think our biggest enemy is the old stereotypes of Arkansas that continue to haunt our reputation. We’re tired of being a “best kept secret”. We were recently recognized on the U.S. News and World Report’s “Top 5 Places to Live” this year, which was pretty neat, but there is still progress to be made. Northwest Arkansas is also a rising destination for mountain bikers from around the world, the home of Crystal Bridges Museum of American Art, and so much more. The better we are at telling our story and doing away with old stereotypes, the easier other challenges like attracting tech talent or investment dollars will be to overcome. The Arkansas Research and Technology Park, which has office space, equipment, and labs available at a subsidized cost for high-tech startups. It houses companies who are building sensors for jet engines, electronics for the surface of Venus, and important efficiency jumps for solar panels. Are there specific public policies or regulatory landscape features that have enabled startup growth in Arkansas? The Arkansas Economic Development Commission has an equity investment tax credit program and an SBIR matching program that helps fund early stage ventures. Also, the governor of Arkansas, Asa Hutchinson, just sponsored the Arkansas Business and Technology Accelerator Act for state funded accelerators, which aims to foster innovation, while also engaging our state’s flagship corporations. On a local level, the city of Fayetteville is working with entrepreneurs on the city’s “Innovation Council,” to be more responsive to the needs of early stage ventures. Are there some startups to watch coming out of Northwest Arkansas? Absolutely! Now Diagnostics is building faster, in-home medical tests for everything from infectious diseases to food intolerance, and Phigenics is making waves in water management safety and efficiency. Lauren James is an omnichannel retail brand, and RevUnit is building collaborative software to help teams work better – they’ve both grown from zero to cracking the Inc. 5000 list over the past 5 years. Also, keep your eye on SupplyPike to shake up the supply chain world, and Bucket Technologies is working to eliminate coin change.